Governor Cuomo, in his eighth State of the State speech, told lawmakers that 2018 will be the “most challenging” year, and he says they will have to fight against what he says are “threats” from the federal government. Cuomo also announced steps to combat sexual harassment and reform the state’s criminal justice system. But he says “2018 may be the hardest year in modern political history”. Cuomo said they will all have to work together to fix changes from the federal tax overhaul that no longer allows New Yorkers to deduct state and local taxes from their federal tax returns. Calling the tax overhaul an “economic civil war”, he says he’s studying how to revamp the state’s tax structure to convert the income tax into a payroll tax. And he generated applause when he vowed to file a lawsuit to overturn what he says is double taxation. The governor also mentioned the state’s ballooning deficit. There’s a $4.4 billion dollar structural gap and he says at least $2 billion more dollars in funding cuts in health care from the federal government. Cuomo did not offer many details on how he’ll deal with the gap, saying only that “Santa Claus did not visit the state Capitol this year”. 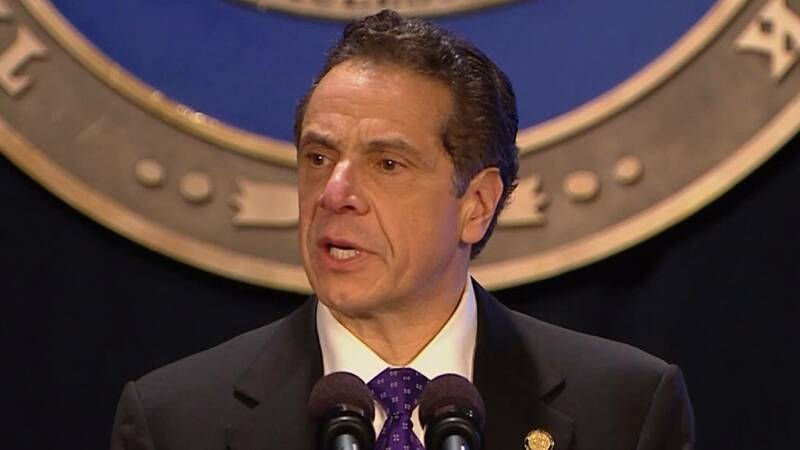 Cuomo also outlined a plan to speed up the state’s criminal justice process, and reform the bail system, and he proposed cashless tolling on the entire state Thruway, saying it’s faster, and also more secure against potential terrorists. Throughout the speech, the governor, who has said he’ll seek re-election to a third term this year, railed against the politics of Republicans in Washington, saying they are “divisive” and threaten unions and gay and transgender rights. He says New York is different and will offer an alternative vision for the nation. Cuomo ended the slideshow accompanying his speech not with a picture of New York, but of the Oval Office in the White House, and he took a shot at President Trump. The governor says hanging “right behind” Trump’s desk is the flag containing the seal of the United States of America, and on it is engraved the words “E Pluribus Unum”, out of many, one. “To find the way forward, the President only needs to turn around,” Cuomo said, as many in the audience cheered. Democrats, not surprisingly, liked the speech, including Senator Diane Savino of the Independent Democratic Conference. Senator Brad Hoylman a mainstream Democrat, says the governor, considered a potential Presidential candidate in 2020, sounded like he could be running, and Hoylman says he’s Ok with that. Cuomo has said right now he’s just concentrating on being governor. Senate Republican Majority Leader John Flanagan says the governor should have talked more about New York’s economy and the exodus of its population.Flanagan says he’s not sure that substituting a payroll tax for the state income tax is a good idea. The Senate leader says he’d like to hear more details on how to curb spending and reduce taxes. And he’s likely to get them when Cuomo releases his state budget in two weeks.